American Fork City’s proposed alignment for the Vineyard Connector to Pioneer Crossing. At an American Fork City Council meeting on August 29, Mayor J.H. Hadfield brought a motion to terminate the agricultural protection on a 200-foot wide swath of land located at 1200 West 200 South in American Fork. The council chambers were filled with American Fork farmers and Lehi residents from Spring Creek Ranch to oppose the change to the agricultural protection. The Utah Department of Transportation (UDOT) has done a study on an alignment for a major road that will continue the Vineyard Connector to Pioneer Crossing in American Fork. American Fork suggested and approved the alignment almost ten years ago when the study was done. Since then, growth in the area has exploded, neighborhoods have been built, and UTA has built a Frontrunner station within yards of the proposed road’s exit on 200 South in American Fork. American Fork City has come up with a possible new alignment for the road that runs through American Fork farmland and butts up to Lehi’s Spring Creek Ranch, connecting to Pioneer Crossing just west of Mill Pond Road. Cassie and Neal Allred are sixth generation farmers in American Fork. When Cassie’s Mom was suffering from Alzheimer’s in the mid-1990s, Cassie went through the process of getting the farm under agricultural protection. Agricultural Protection Areas (APAs) are established to protect farming and ranching operations – they are given “highest priority use status,” meaning they are valued from a regulatory perspective above residential and commercial uses. When a farm or ranch is an APA they are protected against nuisance lawsuits, unreasonable restrictions, changes in zoning designations and adjacent land buyers are notified that they are purchasing land next to a protected farm operation. APAs are established for 20 years and can be modified, renewed, or terminated at the end of that period by the governing body (county or city). Cassie Allred got APA status for some of the acres of her family’s farmland in 1997. “The city saw this as an opportunity to take a section of our property out of Ag Protect because the 20 years is up to give UDOT a green light to put their road through,” said Cassie Allred of the August 29 meeting. The original alignment for the Vineyard Connector to American Fork that UDOT has already done a study on also interferes with a Transit Oriented Development (TOD) American Fork City has made plans for near the Frontrunner station between the Frontage Road and 200 South. A TOD is a type of community development that includes a mixture of housing, office, and retail within walking distance of public transportation. Most of the land in that proposed TOD, however, is APA and owned by Cassie and Neal Allred, Tyree Lamph, and Toni Barnum and none of them are selling their land. “People think a farm is the greatest place to put a road because there’s nothing built on it – because our land is open space they consider it a lot better idea,” said Tyree Lamph. “What they don’t realize is this wasn’t always viable farm land – it was wetlands. We had to put in pipes and drains and spring boxes. When they build on top of this they’re messing with the entire infrastructure under the ground that made it farmable land,” adds Toni Barnum. The Utah County Agricultural Board and the American Fork Planning Commission both recommended that American Fork City keep the agricultural protection in place. “The Agricultural Board sees this as a bad precedence to set, to take away ag protect just for a study. We could be 10 years without protection just so they can do a study that may never happen,” Lamph points out. When the motion to terminate agricultural protection on the 200-foot wide swath of land was proposed at the August 29 American Fork City Council meeting, Mayor Hadfield and each of the council members took a moment to comment on the emotionally-charged vote. City Councilman Rob Shelton, who voted no on the motion, had spoken to legal counsel for the county and the city in anticipation of the meeting. From them Shelton learned that they have until the end of the year to make a decision on the issue and Shelton recommended tabling it and bringing it to a work session or committee before voting. 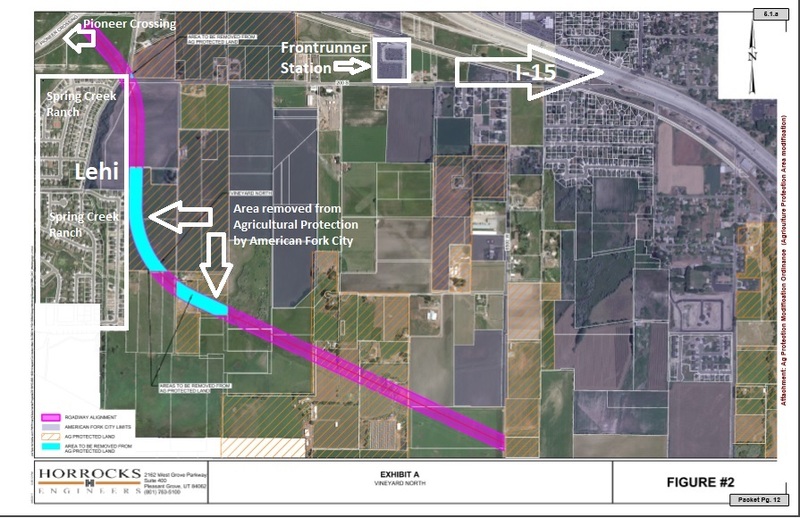 American Fork City Council Member Brad Frost voted yes to terminate the agricultural protection, but explained that his extensive research leads him to believe that the original alignment would create chaos on 200 South. “No matter where this goes it’s going to impact people – developments, where people will drive, where they’ll idle and the health effects from that. We have to facilitate a large amount of traffic that’s going to go west and I think it’s worth taking a look at in a study.” Frost also asked the Lehi residents at the meeting to go to their city council and to research an alternative alignment to show UDOT. Councilman Carlton Bowen voted no, stating that the Allreds being the property owners and showing up to fight for their rights carried a lot of weight. “I think the Allreds are aware that they could get quite a bit of money for their land and what I heard from all four generations is that they would rather have the agricultural use, the ag protect, at least at this point.” Bowen also pointed out that it’s possible to change the TOD. The termination of the APA for the land in question was passed by a vote of three to two. They also had over 50 letters against removing the protection. The overwhelming majority was ignored by AF City. Hopefully Lehi City Council can step up and vote down the Lehi portion of this road.